Eager shoppers queued outside a Doncaster town centre discount store ahead of its opening. Dozens of customers waited in the cold outside Bargain Buys in St Sepulchre Gate as the store was opened to the public for the first time at 10am last Friday. 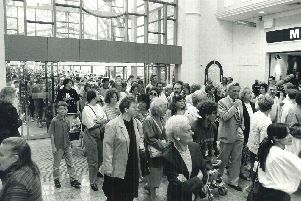 When the doors were eventually opened, bargain hunters raced into the brand new store to take a look at hundreds of special offers. The natiownide chain has moved into premises on the edge of the Frenchgate Centre previously belonging to fashion store New Look. The store offers 10,000 branded products at discount prices, ranging from food and household goods to homewares and toiletries. The firm was launched in 2013 by the same father and son team who brought retail giant Poundworld to the high street. Chris Edwards and Chris Edwards Junior are at the heart of the business and over the next five years the firm aims to open 50 more Bargain Buys stores, giving a total of 70 stores and more than 2,800 employees across the UK.